Last year, Jordan Peele, the “Peele” half of comedy duo Key and Peele, made the socially conscious Get Out, which ended up being one of the best movies of the year, horror or not. This year, John Krasinski, best known as the wisecracking and prank-playing Jim Halpert on “The Office,” hopes to duplicate the feat with the terrifying A Quiet Place. 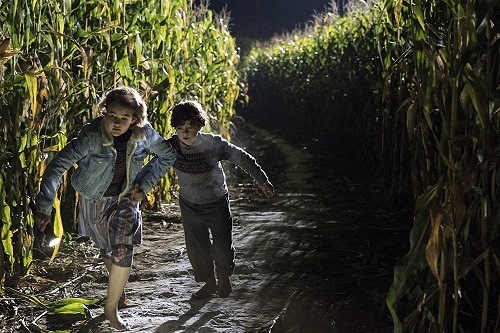 A Quiet Place takes place in the near future – 2020 to be exact – on an Earth that has been ravaged by some…thing…that hunts humans using sound detection as its only sense. Surviving people have to be silent in order to avoid the threat. 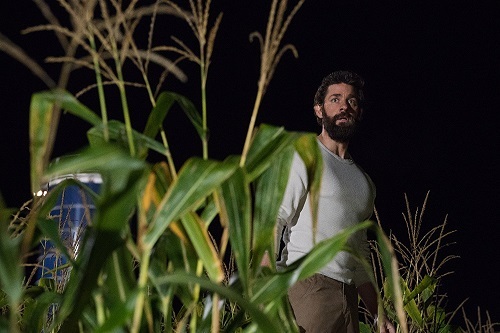 A family of five (Krasinski, his real-life wife Emily Blunt from Sicario, Noah Jupe from Wonder, Millicent Simmonds from Wonderstruck, and newcomer Cade Woodward) has the survival thing down to a science, living off the land and communicating via sign language (with subtitles for the audience) while hiding in their farmhouse compound. But how long can they go on like that before someone makes a mistake…and a sound? If that sounds like a vague synopsis, that’s because it is. Because telling anything more than the basic setup would be spoiling important plot points that are best left to be discovered organically by the audience. 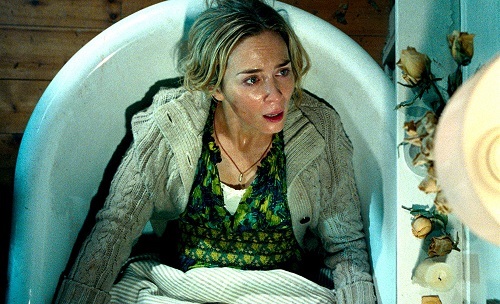 John Krasinski co-wrote the screenplay for A Quiet Place along with Bryan Woods and Scott Beck (the pair who penned Nightlight and The Bride Wore Blood), and it’s full of shocks and surprises, both for the audience and for the characters. It’s an incredible concept for a movie and one that lends itself to an incredible silent intensity that is so thick at times that it’s almost visible. And it’s an incredible experience. What makes A Quiet Place such an effective movie are the little details that Krasinski effortlessly injects into the story. The bulk of it takes place about a year and a half into the “crisis,” so the family’s history can be traced by the little things that they do. The father lines their most-traveled paths with sand to quiet their footsteps. The kids play Monopoly with homemade silent cotton and felt games pieces rather than the clunky (and noisy) plastic and pewter ones. And it’s all so matter-of-fact, like the family has been doing it all so long that it’s become part of their daily routine. These details generate empathy for the characters, making A Quiet Place both uplifting and heartbreaking – viewers are amazed at the family’s resourcefulness but saddened by the fact that they seem doomed from the start. One of the biggest problems that many horror fans had with last year’s It Comes at Night was the lack of closure at the end of the film – basically, the fact that nothing came at night. Well, A Quiet Place is basically It Comes at Night with something coming at night. This is the resolution that people wanted. It even seems as if A Quiet Place could exist within the same dystopian universe as It Comes at Night. Hell, it seems as if A Quiet Place could exist within the Cloverfield universe as well. It’s a creative concept, but also a universal one. As great as A Quiet Place is, it probably won’t be another Get Out, mainly because it doesn’t have as much to say about the state of the world, and so, therefore, it may not be remembered come Oscar season. But it seems as if we’ve hit on a new trend of comedy talents trying their hand at horror. And with David Gordon Green and Danny McBride behind this year’s new Halloween movie, there’s no telling where the trend will stop. And, given the similarities between the pacing and timing of comedy and horror, there’s no need for anyone to want it to stop. If movies like A Quiet Place are what we’re going to get, let’s let every comedian in Hollywood make a horror movie. 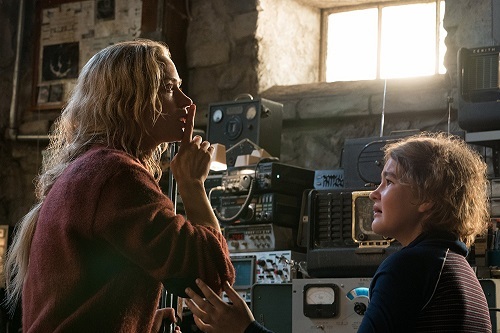 There’s only a handful of spoken dialogue in A Quiet Place, so the sound design is of the utmost importance to the effectiveness of the film, and sound designers Erik Aadahl (Godzilla, To the Wonder) and Brandon Jones (Pacific Rim: Uprising, The Shallows) earn their money. Although the characters don’t talk, the film’s soundtrack is far from silent. The world is populated by little rumbles, creaks, and squeaks – barely discernable noises that would otherwise go unnoticed if the movie wasn’t so deathly quiet. Even the scenes where the characters are able to talk are masterfully mixed, as their dialogue has to be masked by a louder noise, like a river or a waterfall, in order to hide their locations. 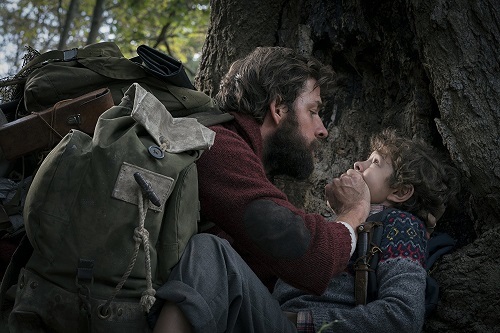 There is a musical score in the film from Marco Beltrami (World War Z, The Snowman), but the best scenes in A Quiet Place are the ones where there’s nothing but the natural sounds of the dampened world combined with those of the characters’ hushed fear. A Quiet Place is absolutely terrifying. The quietness makes the movie ultra-suspenseful, full of tension that is borne out of lean-forward, edge-of-the-seat expectation. Krasinski throws in maddening moments of Hitchcockian show-them-the-bomb suspense as well as cleverly horrific set-ups that, although telegraphed, still get the audience to cringe with anticipation at the inevitable callbacks. And then there are the payoffs; A Quiet Place has just enough jump scares to justify the long periods of nail-biting, and best of all, there’s not a single red herring or cat scare in the bunch. A Quiet Place earns each and every one of its scares, and it’s got plenty of them to go around.